On the second day of their Thailand fishing holiday the anglers were soon casting lures at IT Lake Monsters. It did not take long before one of the lures was slammed by an Alligator gar of 8kg which was quickly released after a few photographs. Continued casting of lures at the various showing fish saw more Gar and Pacu being landed in the next few hours. After a quiet spell Fishing Redtail Catfish of over an hour a change was made onto bait for the rest of the afternoon. Fishing over a regularly baited marginal area the anglers were immediately into a Redtail Catfish on both rods within minutes. Both Redtail Catfish weighed 15-18kg and were quickly photographed before release. Further casts resulted in more Redtail Catfish being landed with fish to 20kg being landed by both anglers. A Spotted Sorubim also followed with it now being clear that the predators had homed in on the baited area. Redtail Catfish continued to visit the baited area at regular intervals throughout the afternoon before the swim fell silent. A large Arapaima could clearly be seen working along the margins close to the baited area and the anglers waited for the impending take. Suddenly one of the rods was away as a large bow wave moved out of the swim. Setting the hook saw the Arapaima breach out of the water in a head shaking display of aggression before powering off towards a the centre of the lake. A ten minute battle followed which saw the Arapaima making powerful and deep runs into the lake. Continued pressure applied by the angler soon brought the fish under control and it was netted soon after without any problems. The Arapaima was estimated to weigh 40kgs and was carefully released after photography and recovery. 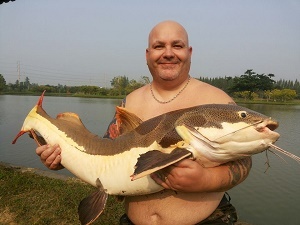 At the end of the days Fishing Redtail Catfish the anglers had landed a joint capture of 35 fish consisting of mainly Redtail Catfish in addition to a lovely 40kg Arapaima.